Officials have now said the pair are "unharmed, in good health and in the safe hands of the joint security team". Government spokesman Ofwono Opondo tweeted that they were rescued "by Ugandan security forces in the DRC [Democratic Republic of Congo]", and that they were now in Kanungu in Uganda. 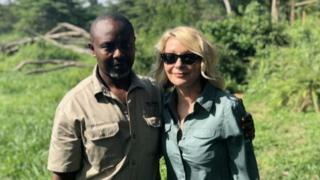 US President Donald Trump also tweeted about the rescue: "Pleased to report that the American tourist and tour guide that were abducted in Uganda have been released. God bless them and their families!" The other two tourists - reportedly an elderly couple - were rescued soon afterwards. After the return of Ms Endicott and Mr Mirenge, Mr Trump urged the Ugandan government to apprehend those responsible. Ugandan President Yoweri Museveni tweeted to reassure everyone that Uganda was safe for travel.